It’s all about having fun on the water, making friends, learning new skills and improving existing ones. You can try windsurfing, sailing or a range of paddlesports such as kayaking, canoeing, sit-on-top kayaks and stand-up-paddleboarding. We’ve got stable beginner windsurfing boards, a mix of sailing dinghies including Access dinghies (which can’t capsize), and a wide range of different canoes to try from the easy sit-on-tops to competition kayaks. There is always something to suit all abilities, and our instructors will help you get the most out of the session. All the activities take place at our base by the Visitor Centre at Druridge Bay Country Park. You’ll be issued with a long-john wetsuit (you can bring your own if you have one), so you need a swimming costume and old trainers or beach shoes. You’ll also need something to wear on your top half and, although a T-shirt is fine if it is really hot, a thermal or fleece top will keep you warmer if it is cool and windy. Please don’t bring valuables with you, as we don’t have lockers in the changing rooms. You also get a waterproof cagoule, a buoyancy aid and a helmet (depending on the activity). You can book for a morning or afternoon session, or for the whole day (supervision is provided over lunch time). Every session can have a mix of beginners and those with experience, and we tailor the activities to the group and weather conditions on the day, so everyone benefits. And at the end of every session – you might get a chance to jump off the jetty before going back for a hot shower! We are a Community Watersports Centre offering affordable canoeing, kayaking, sailing, windsurfing, powerboating, and paddleboarding activities. 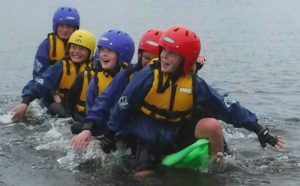 We hire out craft, run guided tours, activity sessions, British Canoeing and RYA courses for all ages. We cater for a range of disabilities. We have two wheelchair friendly bases: on the Lake at Druridge Bay Country Park and on the Coquet Estuary at Amble. 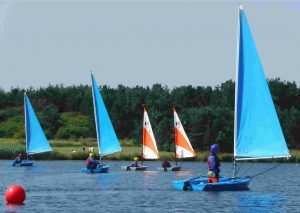 Our aim is to provide water sports and water training for all. Coquet Shorebase Trust, The Braid, Amble, Northumberland, NE65 0WU, England. The Coquet Shorebase Trust is the operating name of Coquet Shorebase Trust Ltd which is a registered charity and a not for profit company. Copyright © 2019 Coquet Shorebase Trust. Powered by WordPress. Theme: Esteem by ThemeGrill.